The works of Kenny Scharf (age 60), the renowned pop artist of the 1980s who worked in New York City along with Jean-Michel Basquiat and Keith Haring, is on exhibition in Seoul. Kenny Scarf, Super Pop Universe (held at the Lotte Museum in Songpagu, Seoul) is the biggest exhibition ever to be held in Asia. Born in Los Angeles, Scharf relocated to New York City in 1978 and earned fame when after meeting Andy Warhol. In 1980, he participated in the New York New Wave Group Exhibition held in PS1, the annex of the Museum of Modern Art in New York. The exhibition will be a meaningful event to catch a glimpse of New York art scene in the 1980, which would become a focal point for the art and cultural world later on. Viewers can see photos of Club 67, the church basement-turned meeting point for artists at that time. Club 57 was the venue where young artists, including hip-ho and punk, convened. Themed parties such as Elvis Presley Memorial Party and lady wrestling and Keith Haring exhibitions were held. The Museum of Modern Art held a massive exhibition under this theme in 2017. The artist’s Jetstone series, which was unveiled in the 1980s, reflects fear of nuclear war and environmental destruction. Jetstones, which was inspired by the famous animation Flinstones, blends anxiety and humor, against the Space Age. A 10-meter-long large mural made by the artist to celebrate the artist’s first visit to Korea is also on exhibition. The painting features two dragons, yin-yang symbol, mountains and the Han River surrounding Seoul. The Cosmic Cavern, which was shown at PS1 in 1981, is also rebuilt. 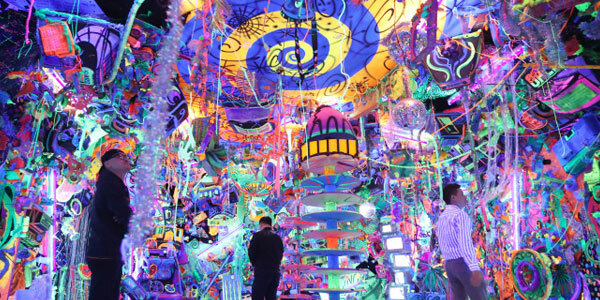 Cosmic Cavern depicts a space fantasy, made of fluorescent paint colored plastic waste, which was exhibited at the Whitney Biennial. Fees are from 7,000 won to 13,000 won. The exhibition opens through March 3, next year.